Saucey peanut noodles and fresh vegetables all wrapped in a rice paper roll! 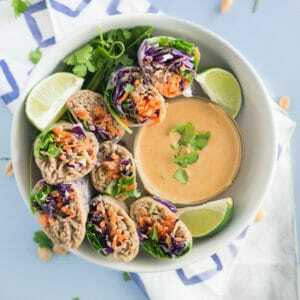 Dip these vegetable spring rolls in extra peanut sauce for a delicious and healthy vegan lunch or dinner recipe. Start rolling with a “roll and tuck” technique. As you are rolling with your thumbs, use your other fingers to “tuck” the fillings in. This will help keep a tight roll.